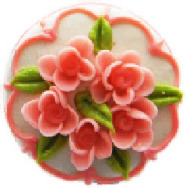 Stylish cake ring made from polymer clay. Silver plated ring. Fully adjustable to fit any size finger. * Not suitable for kids.